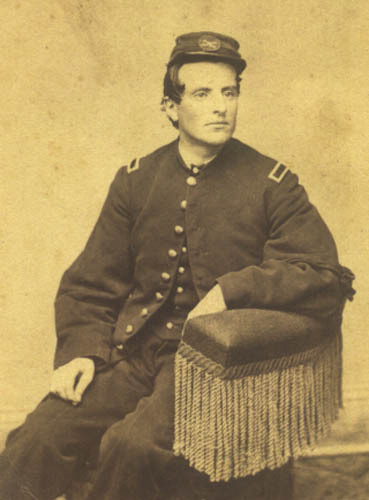 This unknown cavalry second lieutenant is wearing a regulation officer's 9-button frock coat with a mourning armband on the left sleeve. His forage cap has a small crossed sabers insignia without a regimental number, but with a Jaceron wire border more often omitted from forage cap insignia. Under his frock coat he is wearing a vest. His shoulder straps appear to have a dark field, but this is how yellow often appears in period images. His trousers appear to be rather dark in color. Regimental officers should wear light blue, but it is not uncommon for the shade to appear to be about that of the coat. Frock coats were not worn by cavalry enlisted soldiers, but were regulation dress for officers. Many officers wore various styles of jackets in the field, but in this instance the officer is wearing a more formal uniform. The mourning armband is an interesting feature of this photograph. We do not know the circumstances of the photograph. In addition to the armband, it was also custom if wearing a sword to tie a black band around its hilt. The Civil War occurred during the Victorian Era when society had a certain fixation with death, dying and mourning. Queen Victoria lost her consort Price Albert in 1861 and remained in mourning the rest of her life. Her influence in America was profound and elaborate rules of etiquette had formed around bereavement. These customs were particularly focused on women, but males were expected show some signs of mourning while female household members were also in mourning. The period of mourning was based on the degree of relationship, but an armband would also be worn while attending anyone's funeral. The Civil War did interfere with mourning customs. Prolonged displays of mourning had a negative impact on morale and were not encouraged in the field. It is possible that this officer had returned home for the funeral of a family member or had this image taken while the nation was in mourning for Abraham Lincoln. Individual commands issued orders regarding mourning for President Lincoln that included periods as long as thirty days. Typical orders read, "The officers of the Army will wear crape on the left arm and on their swords." There is no photographer's mark on the back but tax stamps date the image to the 1864-1866 period.